New at the shop - Hummingbird Needle Threader from Dritz Quilting! 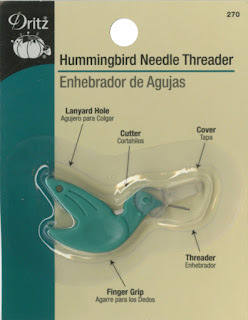 This is an indispensable, multi-feature tool that is used to thread hand sewing needles quickly and easily. The easy to hold needle threader has indented profile for finger placement and gripping. Beak swings upward to expose wire, and then swings downward to protect for storage!